It’s here, it’s here, it’s finally here! OCTOBER is here, everyone! This is the start of my favorite season. A season where the heat finally burns off, pop-up pumpkin patches are a plenty, boots/scarves/and jackets start to make their way to the front of the closet, and the joyous hopeful attitudes that come with the holidays are just starting. I woke up with extra pep in my step on Monday, October 1. 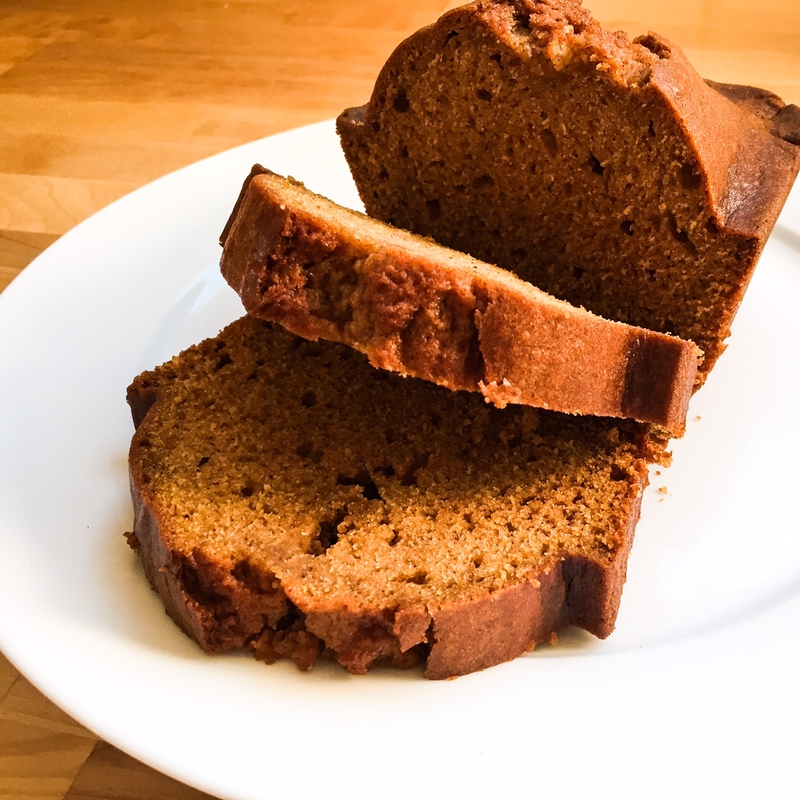 The second my eyes opened I knew exactly what I was going to do to ring in my favorite month – bake something with my favorite ingredient, pumpkin. I immediately text my old college roommate and long time friend who obsesses over all of the fall season flavors like me to join in a baking night. What did we christen the season with? Good ole’ pumpkin bread. Yum yum! This recipe has all my favorite spices in it – cinnamon, ginger, cloves, and nutmeg. Enjoy this bread fresh out of the oven or while your enjoying your morning cup of coffee. It stays fresh and flavorful for up to 3 days. Sift together the flour, baking powder and soda, clove, cinnamon, ginger, nutmeg, and salt in a bowl. In the bowl of an electric mixer combine the pumpkin, brown sugar, and granulated sugar until creamy. If you don’t have an electric mixer you can use some good ole muscle and stir with a wooden spoon or whisker in your favorite mixing bowl. Add the eggs one at a time to the pumpkin & sugar mixture, and then add oil and milk. Mix thoroughly. Add dry ingredients to the pumpkin & sugar mixture. Mix till combined and smooth. Pour batter into baking pan and bake for about 1 hour, rotating the pans halfway through. Insert a toothpick in center of loaf to check if it is done, toothpick should come out clean. May need to cook for 5 minutes longer or shorter, just make sure to check with a toothpick.